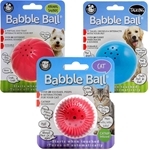 I was a little hesitant to try the Pet Qwerks Animal Sounds Babble ball for our dog. 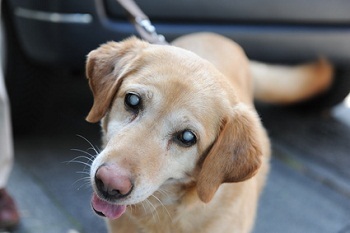 Before she went blind, she was not very fond of inanimate objects that suddenly made sounds. I went ahead and purchased the toy anyway to see how our dog would react. I’m glad I did. She absolutely LOVES it. Sadie was a little taken aback at first. She didn’t know quite what to make of it, but after a few minutes she started picking it up and flinging it around, chasing it, and barking up a storm. She was able to track and find the ball great, as long as it was making sounds. Once the sound stopped, which only happens if the ball is at rest for several seconds, she did need a little help. I completely expected this toy to be a total flop, but it is a complete hit with our dog. Two nights in a row she’s tuckered herself out playing with the animal sounds babble ball. That’s a good thing because she could use the extra exercise due to weight issues brought on by S.A.R.D.S. As mentioned in previous reviews, our dog is an avid chewer and loves to tear her toys apart. The babble ball is made of hard plastic and the medium size is perfect for her. She can pick the ball up, but she can’t tear it apart. Note: Some of the reviews on Amazon mention that the battery cannot be changed once it runs out. However, this information seems to be wrong because there appears to be a compartment that holds the battery that you can open with a screwdriver. Update: Nearly a week later, this is ALL she’ll play with. She loves it to death and will play with it until she’s exhausted. She’s even been sneaking downstairs, while we’re asleep, to play with it. Here is a short video of our girl playing with the Pet Qwerks Animal Sounds Babble Ball. 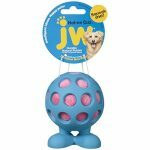 Order a Pet Qwerks Animal Sounds Babble Ball for your dog! 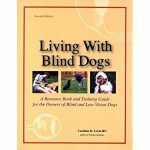 If you’ve found this review helpful, please share it with pups you think it will benefit.